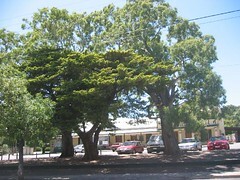 This mature cypress tree stands among the gum trees between Hill Street and Main Road, Willunga, in front of the Alma Hotel. It was planted in memory of Frederick (Fred) Farmer Bassett who died aged 22 years, on 10 March 1917, while on overseas duty during World War I. He was buried overseas in a War Cemetery in Plymouth, UK. Since he had no local burial place or headstone, it was seen as appropriate to memorialise him by planting a tree in Willunga township. It was presumably planted in 1917. Fred's family received a World War I Memorial Medallion from the British Government, colloquially known as a Dead Man's Penny, which is on display at Willunga Courthouse Museum, together with other medals and Bassett family memorabilia. In the minutes of the Willunga Progress Association of 1944 we read that an old resident Maude Aldam was asked the whereabouts of the Bassett family. [The family had moved to Western Australia by this time]. The tree’s memorial plaque, mentioned in correspondence in 1944, is no longer in evidence. The Bassett family were pioneers in Willunga. Fred's grand-parents James Bassett and his second wife Mary were highly regarded school teachers from 1847 to the 1870s. Private Bassett's father, Frederick Farmer Bassett, was Clerk of the Willunga Council and Manager of the Willunga Bangor Slate Qaurries in the 1890s. Do you remember Bassett Memorial Tree ? Then Join up and add your memory here.